My EyeTailYun eyes see da times are Tom cat ruff and tuff while litter levels are dropping, tuna tartare is doin a disappearing act offa da shelves, there'sa no shurimp Rice A Roni on myza stove top, da fog is keeping da sun rays away, CalEyeFurKneeYah is having hiss fits and General Motors isn't purring - hmmm, my 3 years old motor generally purrrrrrs terrificaticaly. Catzowey - I've gotta da upbeat and big treat news and mews fur youza .... yep uh huh, itza da Guido 4 Paws UP exclusacat ways to be a relaxacat! All da perks in da comfurt of yur home. Getta ready to relaxacat! ReFUR to da foto of me and myself on my jungle cat gym. Yep uh huh, thatsa Tiparoni number 1 and as youza see, the secret izza all abouta captivating da Balance - withouta da good balance youza might feel like a hypochondriaticat ... a little offa da balance. Thatsa reason to have da big hiss fit -and definicatically thatsa NOT relaxing! Kick back! But IF youza not wearing da sun screen loshun and potion fur relaxacting, denna youza must catnap under a chair so da "Oh Know Itsa Da Oh Zone!" rays donta attack youza and yurza skin - then yurza delicatable whiskers won't wiggle. Whenza youza puts UP yur feet, Catzowey youza really is relaxing, and yep uh huh, be shure to relax on yurza back when ya can - takes da stress off yurza full and well fed tummy. Fantasticat flexibility is a giganticat part of da relaxing - really molto bene meowvalously- like believe me and myself when I sez da total relaxAYshun makes you a relaxacat. In dis foto I am a total relaxacat! Donta beeza basket case and get a kink in da neck so be shure youza catnaps and relaxacats ina good posishun. Not resting correcticatically can cause a hiss fit when youza wakes up from relaxing. Wishing youza anda yurza a nonCATastrophic week, and hoping there's some relaxacat time inna yurza hecticat schedule! Day AND my birthday only comes once a every year (no matter if you hazza 9 lives or 1!) and its my absoluticatical favorite weekend in the whole 52 weeks of da year. Hmmm, letsa me counta how many catnaps there are inna 52 weeks. Me and myself luvsa Meowmorial Day and I wearza ourza flag purroudly cuzza Ima Patriotikit. Yowza nowza Ima revving up my paws cuzza I am 3 today. Derza rumor: says Ima departing the yungun feline stage cuz the Vet chart sez I'm a teen cat now. Duzza that mean I can get my paws behind da wheel of da Catolac car and drive downtown ? Furget it..I purrfur my limo driver as heeza molto meowster efficient and I canza kick back my paws and be a relaxacat - read da news and mews with my paws up and no road rage hiss fits cuzza Ima in da back seat without a steering wheel. Are youza curious as a cat wondering what I'ma doing to celebrate my birthday? - Well this mighty meowster izza doing something I've always dreamed abouta - playing da piano! It's mewsic to my ears and I purr whenza I hereza da mewsic of my EyeTailYun composers and oPURRahs - like Vivaldi, or Don Cat Giovanni and ofacoursa, da Marriage of Feline Figaro (nope not da Meowzart stuff - heeza not EyeTailYun one bit). Didja know da piano was invented by Bartolomeo Christofori ? Heeza cool cat. Yep uh huh, thatsa me and da Steinway Grand Piano. No way I wazza gonna start my piano lesson on a Yamaha! This fabucatulous grand baby of dem all is courtesy of my speshule furiend, MCP In The City. She gives goodza hugs and gives meeza her piano too! That wiggles my whiskers! It's notta so easy tooza play da piano and my teacher, well she didn't have soza mucha payshunce witha meeza so she turned me loose to learn da keys on my own - her lasta words befur she ran out da door were "Guido get uppa close and purrsonal with da 88 keys and youza donta needa me cuzza youza furiendly - Ciao Baby!" This izza da PURRfect birthday fur me and myself! If youza is inna da neighborhood drop by fur some catnip cake and impurrted EyeTailYan gelato and LaLaLasannya too. Purrobably gonna pop some Furench Bubbly (I dontta drink cuzza I'ma yungun but I likesa to bat da imPURRted corks!) Ya only turns 3 once in a lifetime (even in all da 9 lives there's only 1 time youza can turn 3). What a difference 3 years makes! Hereza my 2 months yungun self learning howza to beeza an acrobaticat in da circus - so, da piano playing shudda be a slam dunk for me and myself! Wishing you a fantasticat, nonCATastrophic and meowvalous week! Without a doubtacat youza knowza all about da old time famous feline book "The Cat In The Hat". And famous bookz like that,well, somethings theyza never goza outta da style (thata means theyza always IN style). Butta definicatically cat chatting, there's absoluticatically no doubt I'ma still in style, cuzza I'm a cat in the hat! Yep uh huh, me and myself izza in style anda thatsa purrobably cuzza I'ma da EyeTailYun kitty too! Attenzionee youza! These izza da colors of myza homeland, EyeTailYa - and I tell ya there'sa no colors likesa these! Didja ever queshun why da purrty rainbow isn't vibracat colors like Red White & Green? Anda more meowvalous news and mews I wanna youza to know - after she catnapped, she CrowShayed da scarf fur me tooza. 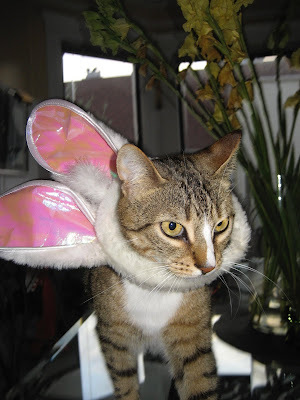 I'ma supposed to beeza saving dis outfit fur Columbus Day feline-festivities but I'ma so ecstatic to have it, so me and myself is checking itta out and inside too. Dooza youza likes this "Maurice ChavalierCat"look? I tipsa my hat to youza cuzza it's fantasticat to knowsa youza. Make it a nonCATastrophic week! Wrap It and Snap It ! Meowster Momma Day comes justa once during da whole giganticat year so I'za always wanna have a PURRfectly wrapped Purresent fur my momma cuzza sheeza my landlord, my banker, my chef and my best furiend. Anda Catzowey! Sheeza just 1 purrson!! It takesa 2 baby - yesiree, I mean 2 of us to wraps up da Purresent purrty so I asked my buddy Yolo to helpza me cuzza betweenza us, weeza gotta 8 paws and abundacat teeth to wrap and snap speshule - and heeza good fur helping to tie da fancy bow real tight. Fantsaticat job and weeza almosta finished - gotta putza da final touch and sit back to seeza da speshule work weeza doing. Weeza thoughts it'd take us a bunch of ourza 9 lives to getta these wrapped up pawsatively PURRfectly and shucksatini weeza exhausticats now so time fur abundacatnaps in da sun. Itsa gooda thing this Mom's holidaze comesa only once a year or me and myself wudda beeza havin hiss fits - itza notta easy wrapping and snapping da big bows! Youza and yurself have a nonCATastrophic week and don'tza getta too wrapped up in stuff. Shuksatini! 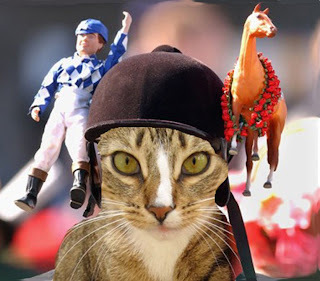 If youza wasn't at da Kentucky Derby on Saturday thena youza missed outta on seeing all da fine folks in their finest of finest and me and myself is reporting here, after da race was run, exacticatically frum da dirt on da famous track. You had to see it to believes it - the Churchill Downs wazza packed to da brims with Hats, Hats and moreza Hats! The Derby Winner "Mine That Bird" had a really CATZOWEY rough start and I'za relates to datta cuz I hada rough start as a smitten kitten. But meowvalous miracles happen fur shure - and he and me are realisticatically purrobably related - weeza both strong guys, weeza both gotta 4 long legs and a tail too. It's increducatulous him and me both got a little white on our faces, real short fur, and it's fantasticat cuz weeza both enjoy bein' outside and runnin' fast. And listen tooza this: heeza gotta a 3rd birthday coming up on May 10th and I turns 3 too on May 26th. I might have ta invite him to my pawty so we can horse around! Now, I wanna YOU to go and have a winning week!